“Peace Lines” Are An Urban Architectural Feature Found Throughout? 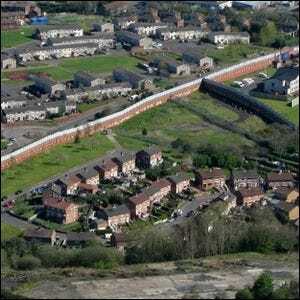 Throughout urban areas in Northern Ireland, you’ll find long meandering walls made of brick, iron, and/or steel that are upwards of 25 feet in height. These barriers, known as “peace lines”, mark the borders between Irish nationalist and unionist neighborhoods. The walls were first erected in 1969 following the Northern Ireland Riots and a period of unrest known as “The Troubles.” The barriers were originally intended to serve as a temporary solution to help ease tensions between the nationalists (those who identified as Catholic and Irish) and unionists (those who identified as Protestant and British). Despite the initial idea that they would be dismantled after six months, they proved so effective that not only did the initial walls stay erected, but more peace walls were built until the original handful of walls multiplied to 48 in the present day. Although nearly half a century has passed since they were first erected and despite the political calls to remove them and integrate the neighborhoods, tensions remain high enough in Northern Ireland that more than half the residents of the most peace wall dense city, Belfast, favor keeping the walls up to promote peace between the city’s neighborhoods.